There are several routes up Kilimanjaro and the choice can become bewildering. The purpose of this guide is to honestly lay out the pros and cons of each route and aid your decision. Put simply, in an ideal world speed and cost should not be your primary consideration when choosing a route. The Marangu route offers easily the cheapest prices on the mountain, but that cost saving can be negated by the poor summit prospects, with less than 50% making it to the top. We've tried to tease out the pros and cons of each route. If you make it all the way to the end, we've thrown in our general recommendations, which are of course subject to your interests. * Note: Marangu has traditionally been the cheapest option because it was the simplest and easiest for an operator to equip. With a paved road to the gate, huts and communal kitchens, the equipment and staffing requirements are far lower than other routes. It also has a reputation as the least physically demanding route, whilst this may be true it is also offers the worst acclimatisation. 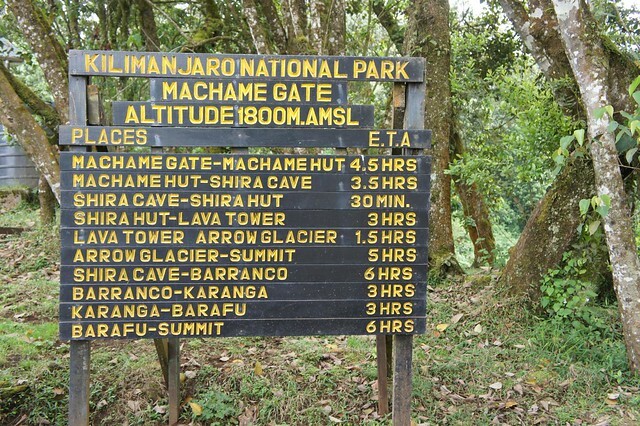 Machame is traditionally known as the most beautiful route on the mountain and has grown in popularity to surpass Marangu. After Marangu it is the most accessible for operators, and is therefore cheaper than other options (barring Marangu). The main draw-back (and only notable criticism) of Machame are over-crowding, particularly where Shira, Old Lemosho and Umbwe converge with Machame at Barranco. The traditional Rongai route is a fairly direct slog offering poor acclimatisation (summit rates as low as 50%). Instead we sell a trek on the unique TK Rongai route, a pioneering route with unparalleled successful summit rates. TK Rongai is our favourite route on Kilimanjaro. Umbwe is traditionally the hardest route with the poorest altitude acclimatisation. It tends to attract hardier sorts, particularly those attempting the recently re-opened Western Breach. Everyone will have different priorities, but to put your reading in context, these are the main routes we usually recommend.